The soft silicone wristband is specially designed to work with Fitbit Blaze. Built from sturdy material, effortlessly complement your style with our stunning Fitbit Blaze bands with black / rose gold frame. Made from smooth durable silicone, protects your Fitbit Blaze from dirt and scratches and secure while running, dancing or working out. YOUKEX ensures the longest after-sales service for your Fitbit Blaze Band! 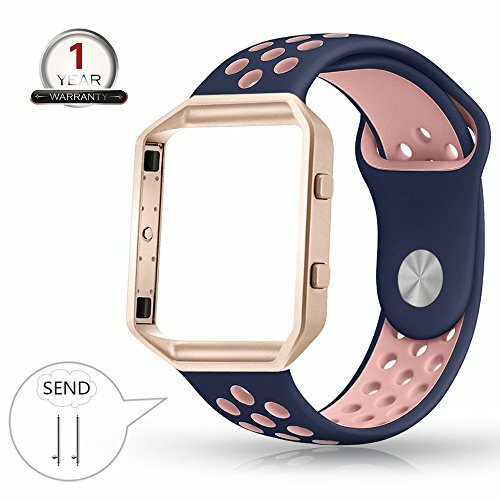 Fashion hybrid soft silicone bands with rose gold metal frame fit for Fitbit Blaze Fitness Watch (Tracker is NOT included). These wrist bands for fitbit blaze are made of durable and flexible silicon, waterproof, elastic, lightweight and environment friendly. It will be best choice for women and men for outdoor activity. Small size fits for 5.8"-7.6" wrist, large size fits for 6.8"-8.8" wrist, a row of pressing die forming airflow holes and pin-and-tuck closure design allows you choose the most comfortable size for yourself. Premium stainless steel frame protects the watch from scratch and holding the band safely, easy to assemble / remove, symbolizing fashion, nobility, durability and elegance. Breathable and combined design, made by unique two tone injection molding technology, never fade or dim. If you have any questions about this product by YOUKEX, contact us by completing and submitting the form below. If you are looking for a specif part number, please include it with your message.